Ocean views. Great large family beach house. 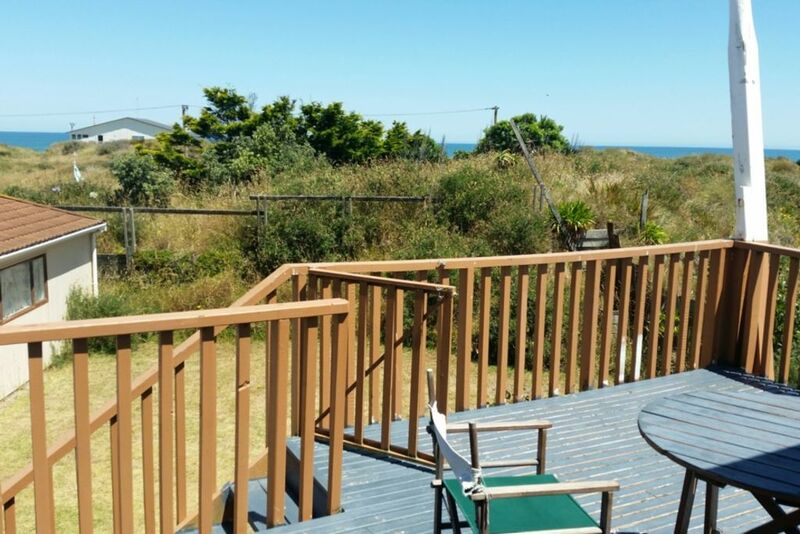 A large sunny second storey deck with views over the ocean from Kapiti to Mt Ruapehu. Furnished as a home away from home: fridge freezer, microwave washing machine, dryer, TV - SKY SPORT, Stereo/turntable. Kitchen fitted out completely to accommodate home cooking if you wish. Huge flat sunny front and back sections in a quiet cul de sac. Section and house maintain all day sun. The large back yard and a range of children toys are available including sand toys, puzzles, toy basket and kids books supplied. Located 200 meters from local cafe open every day from breakfast to dinner, or use the really popular local fish and chip shop!! Only minutes to Foxton Reserve, Playground, 3 Tennis Courts and Skate Park - Great for keeping kids entertained - Nice and quiet flat cul de sac for riding bikes, walking, going to feed the ducks. Estuary and Boat Club nearby - Suitable for boating - Beach is permitted for driving on. This fantastic bach is a great family beach house. Walk 200 metres to get an ice cream down the road or 200 metres to the beach - Or if you want to take a drive 5 minutes down the road are the Foxton Shops, working Dutch Windmill and Swimming Pools. Can sleep up to 9. Portacot available. Two toilets. Great holiday home or quick escape from the city. Just one and a half hours drive from Wellington and 30 minutes from Palmerston North. Look out over the sea. A fantastic swimming beach with surf life savers on duty over summer. Great for wind activities like kite surfing, blow carting or just going for long strolls. View the sunset and listen to the waves from the deck or the lounge. See Ruapehu during breakfast and Mt Taranaki in the evening and all day views down to Kapiti Island. Second time we have stayed here. Great batch with a really homely feel. Worked really well for the 6 of us. Barbeque could use an upgrade and the decor is from the 80s but perhaps thats part of its charm. We love it and will no doubt be back again. We enjoyed our stay at this Foxton Beach Bach. The beach and sand dunes are very close which makes the location wonderful. The views from the house are good in all directions with lots of natural light. The manager was very helpful with everything. The place will be in need of a flooring and furniture upgrade soon...lot of wear and tear... but it is a beach house ! We brought our visitors from the European winter out to stay at the beach, this was very convenient with gorgeous views from the verandah of the sun setting over the sea, and just a short walk down to the beach. Tidy and clean and the beds were comfortable. Hope to return sometime soon. Thanks for having us. Was a great little getaway. Beautiful area. The owner was accommodating as we extended our stay twice. The Bach had everything you needed and more. Thank you and well worth a visit.